If there is something that I've been a bit reluctant to change to ecological on the personal hygiene part is the deodorant. It's horrible to find out that the one smelling sweat is acctually yourself, but then again I am not too keen on using deodorants that contain aluminium. So at first I used eco deodorants only at home and my old deodorants when going out ( they needed to be used up as well, right?) 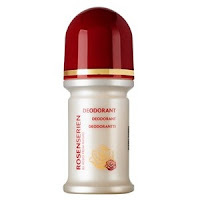 Now, gradually I use mostly the Rosenserien deodorant and sometimes my Madára deodorant. 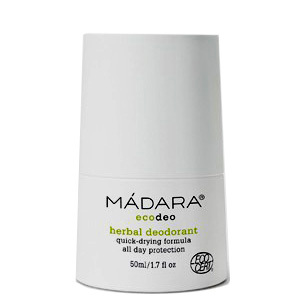 I usually love Madáda's products but the deodorant was perhaps a bit too herby for me. The Rosenserien one is more "soft" in smell, which I like better. Anyhow, before during winters I used to get really dry under my arms and yesterday I realized that it's springtime and I have not been dry under the arms for the whole winter so far! Can it really make such a difference?! That's great! I'm not changing back even if I feel a bit unsecure about my smelliness sometimes. 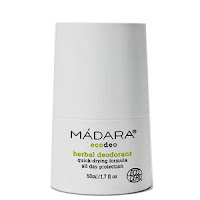 I've heard though that it might take a bit of time before you feel the eco deodorants are working as well as the not-eco ones as your body is sweating out the toxins from before. Not sure I am bold enough to try making my own deodorant from coconut oil just yet though!